A series of intense storms in the Arctic has caused fracturing of the sea ice around the Beaufort Sea along the northern coasts of Alaska and Canada. High-resolution imagery from the Suomi NPP satellite shows the evolution of the cracks forming in the ice, called leads, from February 17 -- March 18 2013. The general circulation of the area is seen moving the ice westward along the Alaskan coast. 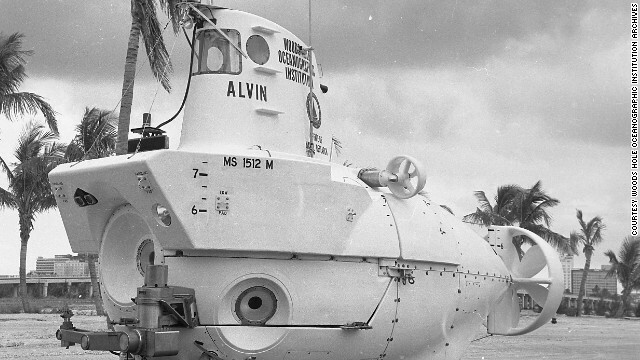 The tiny three-man submarine Alvin has been the workhorse of ocean research for nearly 50 years - finding new life forms and advancing understanding of the underwater world. It is nearing the end of a $41m refit and is about to embark on a series of engineering test dives before returning to the ocean for research duties in May. Despite most humans' land-centric view, Earth is an ocean planet. The global ocean covers more than two-thirds of our planet's surface and makes life as we know it possible: it produces half of the oxygen we breathe, helps regulate our climate and provides the single largest habitat for life on Earth. Yet, with nearly 2 miles or 3,000 meters of water covering more than half the surface of our planet, much of this vast realm remains unexplored and unexamined. "What happens in the vast, deep ocean, out of sight and beyond the reach of sunlight and satellites?" asks chief scientist Chris German. He is on a mission, with his team at the Woods Hole Oceanographic Institution, to find out. They developed Sentry, a robotic underwater vehicle used for exploring the deep ocean. Indeed, our progress is not limited by scientists' and engineers' imaginations, but rather by the rate and cost of development of technologies suitable to pursue the cause. Advances in satellite technology provide us with global coverage in the study of Earth's atmosphere. But in the case of the ocean, that approach quite literally only grazes the surface. In 1977, the development of new technology allowed the human-occupied vehicle, "Alvin" to explore a volcanic ridge 2500 meters below sea-level. "This discovery changed our understanding of how life can function here on Earth and opened entirely new fields of research," says German. What happens in the vast, deep ocean, out of sight and beyond the reach of sunlight and satellites? 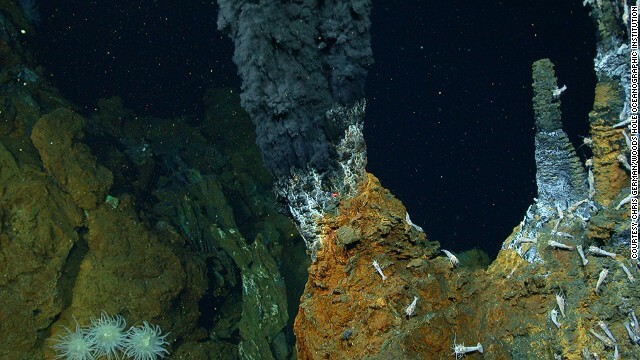 Here's one example why we should care: in 1977, diving in the human occupied vehicle Alvin, scientists investigating a volcanic ridge 2500 m (1.5 miles) below sea-level found something totally unexpected -- lush ecosystems thriving at hydrothermal vents fueled by chemical energy released from the Earth's interior. This discovery, made just three years after new technology first enabled Alvin to reach these depths, changed our understanding of how life can function here on Earth, and opened entirely new fields of research. The development of new technology is crucial to our understanding of this vastly unexplored realm. Researchers use Remotely Operated Vehicles (ROVs) to examine hydrothermal vents up to 5km below the surface. 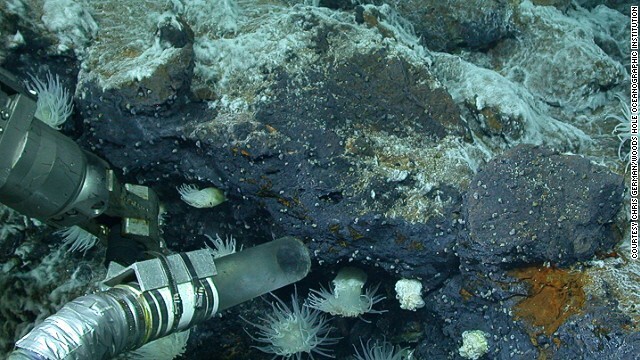 We now know that the hot-springs that sustain these "vent" ecosystems occur in every ocean basin and are host to hundreds of previously unknown animal species. In the past 30 years, those new species have been discovered at a rate of about one every two weeks -- and we still have more than 75% of this 55,000-kilometer (>34,000-mile) volcanic ridge system to explore. These same sites also host large metal deposits, which could become essential mineral resources for us in the future and some of these same systems may even reveal how life first originated -- on Earth and beyond. 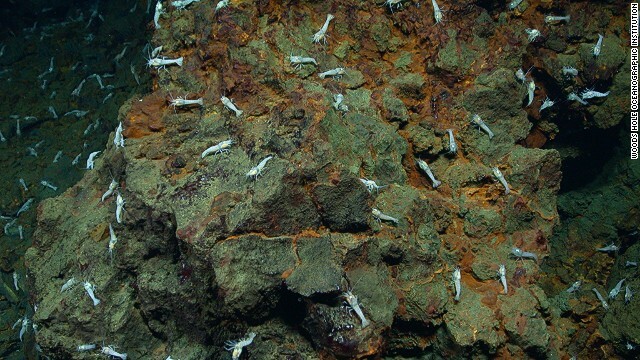 At the scene of German's latest explorations, newly-discovered vents on the Mid-Cayman Rise, the dominant fauna is a new species of blind shrimp that feed on microbes fuelled by the chemical energy released from Earth's interior. The shrimp, in turn, are devoured by shrimp-eating anemones. Given all the discoveries that we have made from an up-close investigation of these ocean ridges, we can't help but wonder what we might find at the far end of the same plate tectonic cycle where seafloor is drawn back into the Earth's interior at deep-ocean trenches. To date, only three humans have ever ventured to these deepest parts of the ocean -- the 1960 dive of Jacques Piccard and Don Walsh in the Bathyscaphe Trieste went unmatched until James Cameron's dive in his Deepsea Challenger last year. These were pioneering dives that took great courage. 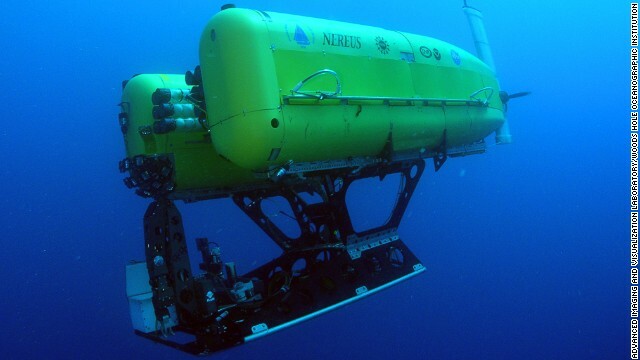 But to truly explore ocean trenches, scientists need to study them methodically which requires routine access to emerging technologies such as the Hybrid Remotely Operated Vehicle Nereus, which dove to the Challenger Deep in 2009, to the Cayman Trough in 2010 and will return there this summer, and to the Pacific in 2014. If our study of trenches progresses at the same rate as our past exploration of ocean ridges, however, another 30 years may pass before we've explored even one-fifth of them. And it's not just the trenches that need to be explored but the vast ocean volumes themselves. 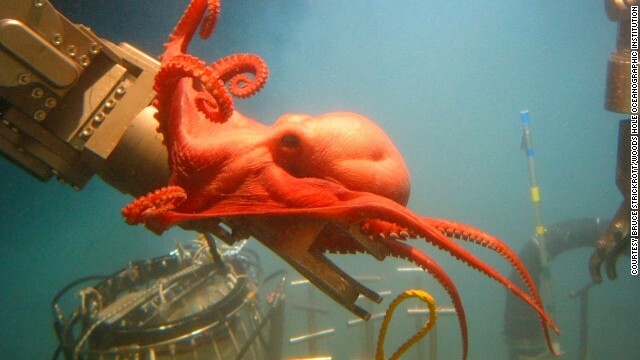 Alvin pilot Bruce Strickrott encountered a docile deep-sea octopus 2,300 meters down in the Gulf of Mexico. Instead of swimming away, it grabbed the submersible's robotic arm, normally used for picking up samples of seafloor rocks and organisms. Despite a decade of internationally-coordinated global investigation through the Census of Marine Life, for example, Earth's largest ocean basin, the South Pacific, also remains its least understood. We believe the deep Pacific, for now, remains relatively untouched by the atmospheric pollutants (bomb-test radionuclides, chlorofluorocarbons) that are already penetrating deep into the Atlantic. But how to characterize its pristine state before it is too late? Put simply, we need to innovate beyond the conventional ways of doing our work. Woods Hole Oceanograhic Institution's Nereus is a one-of-a-kind vehicle that operates as a free-swimming robot to conduct surveys and close-up investigations of seafloor organisms. It reached Challenger Deep in 2009 and in 2014 will be used to conduct the first systematic study of life in ocean trenches. In addition to direct human exploration of the seafloor, we need to mobilize a new generation of collaborative self-powering robots that can explore the oceans, top to bottom, while maintaining communication to shore-based scientists at all times. 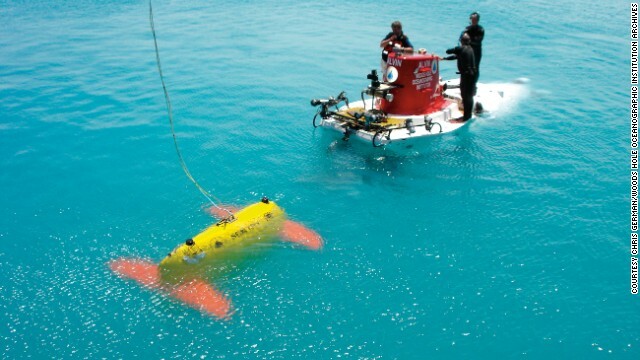 These robotic systems must be programmed with enough decision-making autonomy to know when to diverge from a mission to follow something important and unexpected that they have encountered, and to know when to alert a scientist on shore to solicit input on what they should do next. Fueled by chemical energy released from the earth's interior, lush ecosystems thrive at hydrothermal vents. Here, the suction-tube sampler of the Institution's ROV collects a sample of tiny snails. The development of these kinds of vehicles and systems is already underway, through partnerships between leading robotics laboratories and deep ocean engineers, in efforts such as the new Center for Marine Robotics at Woods Hole Oceanographic Institution, but we need to turbo charge that effort. As the technology expands and improves, we will also need to find new, more effective ways for humans and robotic systems to interact over the vast and remote distances involved. 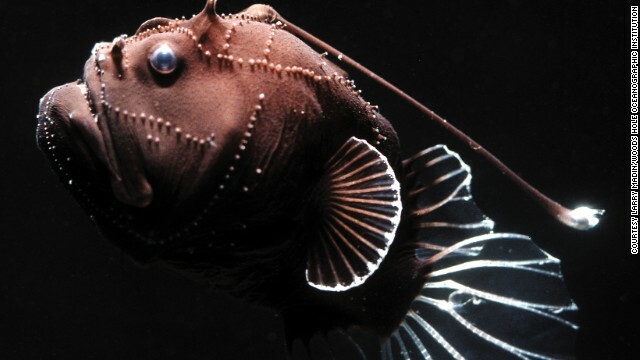 Just three inches long but fierce-looking, it has a long spine tipped with bioluminescent tissue that it can dangle in front of its mouth. The technologies we need for this comprehensive exploration and understanding are within our grasp. And we'll need the knowledge that results to cope with the many challenges we face—climate change, food and resource depletion, pollution. Understanding our Earth's oceans has never been more crucial: they aren't just a defining feature of our planet; they're our life support system. Today 1021 NOAA raster charts (2166 including sub-charts) are included in the Marine GeoGarage viewer. Bezos Expeditions, led by Amazon and Blue Origin founder Jeff Bezos, located and recovered remains and debris from two F-1 engines that powered Project Apollo's Saturn V rockets. They located and photographed others artifacts as well. 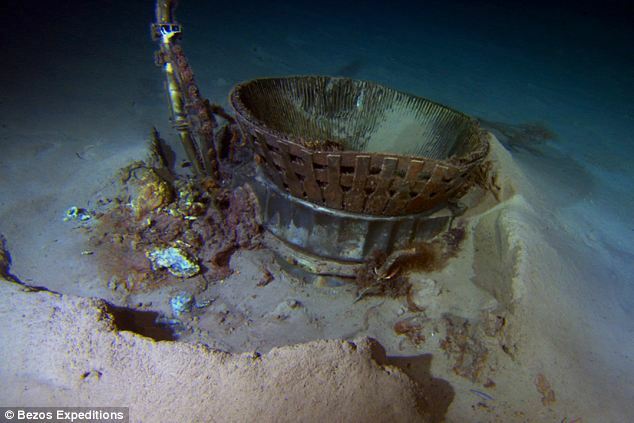 After lying on the ocean floor for more than 40 years, two Apollo rocket engines that helped deliver astronauts to the moon are once again seeing the light of day. A team organized by Jeff Bezos spent three weeks fishing at sea to recover the corroded F-1 engines, which sat more than 4 kilometers below the surface of the Atlantic Ocean. Bezos does not yet know precisely which Apollo mission the engines flew on as the original serial numbers on the objects are missing. He is hoping they are the Apollo 11 engines that brought the first men to the moon. On Mar. 20, his team’s ship was heading back to Cape Canaveral in Florida with the aged pieces to restore them and perhaps determine which mission they came from. 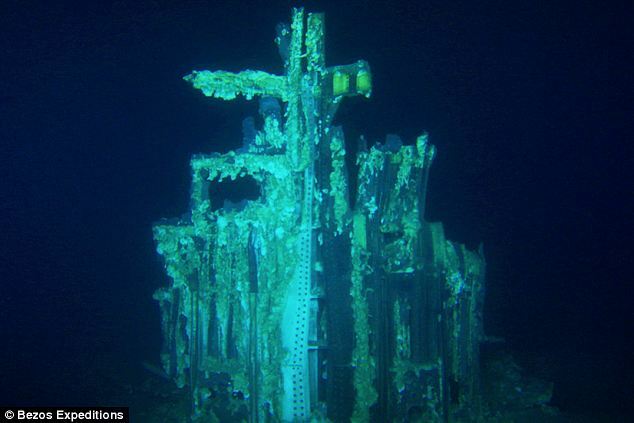 “We’ve seen an underwater wonderland – an incredible sculpture garden of twisted F-1 engines that tells the story of a fiery and violent end, one that serves testament to the Apollo program,” Bezos wrote in a blog post. Billionaire Bezos, founder and CEO of Amazon.com, announced his intentions to pull the Space Age relics up from the depths almost exactly one year ago. Little has been heard about the endeavor since then but that’s often how Bezos works. His private rocket company, Blue Origin, is probably the most secretive new corporation getting into the commercial launch business. Pulling the F-1 engines up was a tremendous engineering challenge. The team used remotely operated vehicles tethered with fiber optic cables to work in the black depths at the bottom of the Atlantic. After restoring the engines and stabilizing them to prevent further corrosion, Bezos hopes to display them at the Museum of Flight in Seattle, though the ultimate decision for where to put them will probably involve NASA. “This is a historic find and I congratulate the team for its determination and perseverance in the recovery of these important artifacts of our first efforts to send humans beyond Earth orbit,” wrote NASA Administrator Charles Bolden in a statement about the recovery. The F-1 engines flew on the gigantic Saturn V, still the largest and most powerful rocket ever built in the U.S. Each engine is nearly 6 meters tall and 4 meters wide and weighs more than 8,000 kg. They produced 7.7 million pounds of thrust and brought the Saturn V to nearly 58 km above the Earth at a top speed of and to a speed of almost 10,000 km/hr. Welcome to the great South China Sea battle of maps. While fears mount over the risk of conflict or miscalculation in an increasingly militarised expanse, this particular skirmish has already been under way for years. A very public front opened in the fight late last year when China, in a sly piece of cartographic manoeuvring, included its controversial "nine-dash line" claim to virtually the entire sea in its new passports along with other disputed borders. India, Vietnam and the Philippines were swift to protest - and forced to launch bureaucratic countermeasures. Less visibly, the battle of maps has been a long-running war of attrition as various claimants desperately attempt to create evidence of sovereignty. Tensions are rising as China and other south-east Asian nations vie for sovereignty over potentially oil-rich areas of the South China Sea. Back in 2009, it was a map of the nine-dash line affixed to a formal Chinese protest note to the UN against Vietnam and Malaysia that, in part, inspired mounting regional concern at Beijing's diplomatic and military assertiveness. China's nine dashes can be found in all manner of official and private contexts, from state-published national maps and airline magazines to route maps and corporate reports. Three years ago, I noticed an inflatable beach-ball globe for sale in a Sydney airport bookstore. As it was made in China, it naturally featured a tiny nine-dash line - not that Australia officially dignifies it. Vietnam is no slouch on the cartographic front, either. For years, its maps have included detailed insets of the disputed Paracels and the Spratly archipelagos - without spelling out the eastern extent of its claims. One recent national tourism map - produced by a state publishing house - included both island groupings in considerable detail, right down to individual reef structures. The typeface was larger than even that used for the capital Hanoi. There is considerable irony here, of course - no tourists are yet allowed to visit the heavily fortified Spratlys, neither to Vietnam's 20-odd bases nor the significant number manned by the militaries of rival claimants, including China. The Paracels, meanwhile, remain firmly in the hands of China after its defeat of the then-South Vietnamese navy in 1974 completed its occupation. Intriguingly, though, Hong Kong seems like some kind of virgin territory as the fight rumbles on, judging by the SAR government's own maps. While the government doesn't produce maps or nautical charts of the wider region, some Hong Kong maps include an inset that includes at least part of the South China Sea. 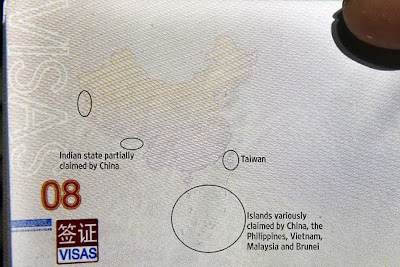 But, strikingly, unlike the Beijing-produced versions, the insets don't even show part of the nine-dash line. The popular map "Hong Kong in its regional setting", for example, neglects the line even though it sources mainland references. It is conspicuous by its absence, too, on the Observatory's website, which includes a regional map as part of its typhoon tracking feature. 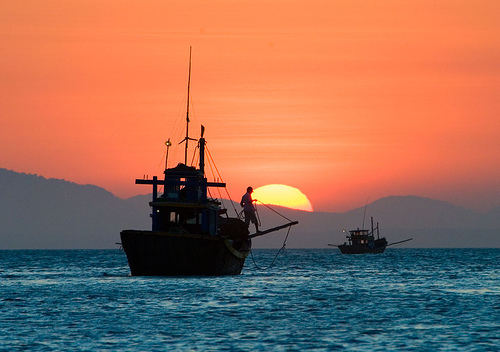 Conspicuous, at least, to the Vietnamese and Filipino fishermen who increasingly turn to the website as they attempt to dodge typhoons in their quest for disputed catches. Much fanfare accompanied the Sept. 25, 2010, launch of the Air Force’s Space Based Space Surveillance satellite. The $833 million craft was finally going up to do its job: monitor orbiting items from space itself, free of the time constraints and atmospheric interference that hamper its earthbound counterpart, the Space Fence. Its 30-centimeter telescope, mounted on a two-axis gimbal, would help keep tabs on satellites as far away as geosynchronous orbit as well as thousands of bits of space junk closer in. The builders said SBSS would be on the job within 60 days, and forecast a working life of at least 5½ years. Shortly after launch, the satellite passed over the South Atlantic, and things went awry. The satellite was hit by radiation that sent the sensors reeling and knocked out an electronics board payload. Suddenly, the expensive, specially-designed satellite could no longer do what it was built for. The effects of radiation are part of the price of doing business in space. There are solar flares, random magnetic distortions and what some NASA scientists call euphemistically the “killer electrons” of the Van Allen radiation belts. The place where spacecraft are most vulnerable, though, is an area slightly larger than the United States, centered 300 kilometers off the coast of Brazil, where the trapped charged particles of the doughnut-shaped Van Allen radiation belts and cosmic rays from sun storms combine and bottom out at about 200 kilometers above the planet. Its formal name is the South Atlantic Anomaly, but some call it the Bermuda Triangle of space. These two nearly identical spacecraft launched in August 2012 and with only six months in operation, they may well be rewriting science textbooks. 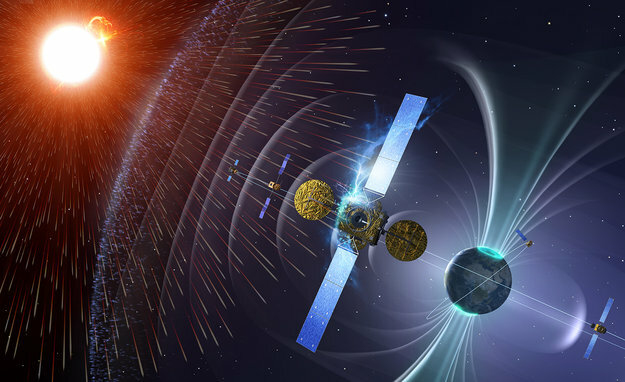 The probes study the Van Allen belts, gigantic radiation belts surrounding Earth, which can swell dramatically in response to incoming energy from the sun, engulfing satellites and spacecraft and creating potential threats to manned space flight. James Van Allen discovered the radiation belts during the 1958 launch of the first successful U.S. satellite. Subsequent missions have observed parts of the belts, but what causes the dynamic variation in the region has remained something of a mystery. It’s directly in the path of satellites in low Earth orbit, which fly through it regularly — in some cases, multiple times a day. “The South Atlantic Anomaly is the rocky road of radiation storms,” said Vic Scuderi, manager of satellite electronics at BAE Systems in Manassas, Va.
NASA scientists believe that there is a cloud of protons, followed by a cloud of electrons, followed by a cloud of protons, etc., where the inner Van Allen radiation belt dips down in the anomaly. “A lot of theoretical people have tried to justify it,” said Old Dominion University professor Francis Badavi. “The typical spacecraft engineer hasn’t been able to come up with a reason” for it. All they know is that radiation in the South Atlantic Anomaly is intense, that spacecraft have to be designed to deal with it and that, even then, there is potential for peril. Scientists have a working theory that the Earth’s magnetic field is caused by its molten iron center. Because that core rotates at a slightly different pace than the planet’s surface, the field generates magnetic North and South poles slightly away from the geographic poles that form the Earth’s rotational axis. That’s the explanation for something even every hiker knows: that the magnetic north shown on a compass is not true north. 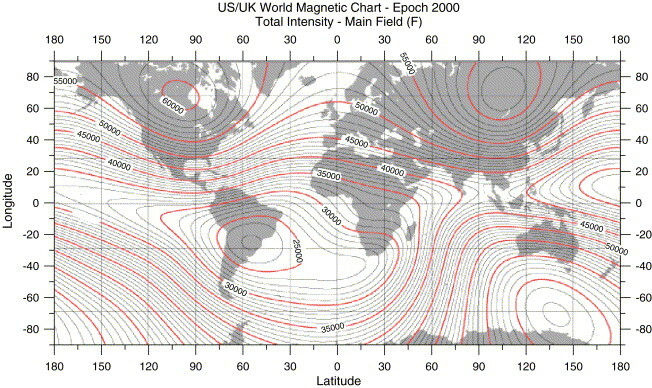 That offset also is believed to be the reason that the Earth’s magnetic field is weakest in the area off Brazil. Less hindered, the inner Van Allen radiation belt dips closest to Earth there. The anomaly was discovered in 1958 as part of a study of space radiation belts by University of Iowa physicist James Van Allen, whose suspicion was aroused by the Soviet Union’s Sputnik satellites. Soviet scientists believed the primitive data-recording device on board Sputnik I was faulty because it told of radiation levels well beyond anything they believed possible. But Van Allen postulated that the device was fine and that the inexplicable radiation did indeed exist. Four months after Sputnik went up, the U.S. launched its first satellite, Explorer I, and Van Allen began to investigate the radiation belts that today bear his name. In the 1960s and early ’70s, the Air Force and NASA flew a covey of 22 satellites to map the Van Allen radiation belts between altitudes of 200 and 36,000 kilometers. The flights generated databases that are still in use today. On Aug. 30, NASA launched its Radiation Belt Storm Probes (later renamed Van Allen Probes), twin satellites on a two-year mission to do more mapping and to update those databases. Shielded by quarter-inch aluminum, the sensors are flying into the radiation belts for long periods, trying to solve a puzzle. At other times, the belts lose particles. And sometimes nothing at all happens. “The problem is, there is no unified idea of what phenomena are most important inside the belts,” said mission scientist David Sibeck. The Space Based Space Surveillance satellite that was bashed so badly in 2010 was eventually brought back to life. A software patch was developed and tested over the course of more than a year, and the SBSS was declared operationally capable 23 months after launch. SBSS builders Boeing and Ball Aerospace referred questions to the Air Force, which did not respond by press time. The satellites’ fate illustrates the problems the South Atlantic Anomaly can cause even to the most well-planned ISR missions. Tom Logsdon, a former Rockwell Collins engineer, now retired, explained that the radiation can confound the very heart of the software on a satellite. “One of the things that happens is, you can get logic upsets,” Logsdon said. “You get a charged particle coming through the satellite, and it can flip some of the binary ones to binary zeros, and vice versa. Not every satellite damaged by the Anomaly takes so long to fix. In October, the SpaceX Dragon, part of a $1 billion contract with NASA to supply the International Space Station, suffered a single-event upset en route to docking with the ISS. A remote electronic unit became inoperable as the craft passed through the South Atlantic Anomaly. A quick power cycle and re-synching remedied the issue. Other programs work around the Anomaly. To avoid exposing astronauts to intense radiation, spacewalks are not scheduled on the International Space Station when it’s passing through the Anomaly — which happens two to five times a day. As a precaution, NASA engineers simply shut down the Hubble Telescope as it is going through the SAA, to protect its equipment. Smaller commercial and military satellites carry radiation detection devices — themselves vulnerable to radiation — that trigger shutdowns and power-ups of sensors and computers. Satellites carry radiation-hardened electronics of varying degrees to deal with the energy that accumulates. “Commercial and defense-contracted satellites are typically on a 15-year mission timeframe, and they have to withstand hammering the whole time,” BAE’s Scuderi said. “The electronics that we put on board the satellites can accumulate up to 500,000 rads” or radiation absorbed doses. “A human being can only absorb about 400 rads in a lifetime,” he said, by way of comparison. That accumulative effect is called a “total ionizing dose,” and it’s largely predictable, in part because orbital trips through the SAA are predictable. As the ions pile up, the satellite can become impaired. On March 8, 2012, a flurry of eruptions on the sun began sending enough energy into the Earth’s upper atmosphere to power every home in New York City for two years. Over three days, 26 billion kilowatt-hours pounded the thermosphere, which begins about 53 miles up. Infrared radiation from the thermosphere’s carbon dioxide and nitrous oxide re-radiated about 95 percent of that energy back into space. Some satellites orbiting Earth were hit going and coming by radiation that, NASA assessed, would cut their lives short. And there are more storms ahead because, this year, the planet reaches the apex of an 11-year solar event cycle. Around the world, a satellite is launched about every four days with varying radiation mitigation capability, generally dictated by its budget. While the day-to-day radiation in the South Atlantic Anomaly and throughout the Van Allen radiation belts can be anticipated, the inability to predict solar storms makes the jobs of designers and operators more difficult. With more notice, operators could do things like shut down equipment to lessen vulnerability. But they understand the problem. “We can’t produce an accurate forecast for rain here on Earth more than three days ahead,” Scuderi said. Still, NASA and NOAA try, albeit with diminishing funding and satellites that are wearing out. The Radiation Belt Storm Probes twin-satellite mission is another in a long line of research efforts. “We’ve spent a lot of resources trying to predict solar activity, but we’re still not there,” Badavi said. A former DoD intelligence official said the South Atlantic Anomaly is just part of the ISR challenge. A striking image of Verrazano Bridge in Brooklyn as Hurricane Sandy approaches on Oct. 29, 2012. The potential link is just one of many ways that human activities can, and in some cases already seem to be affecting Earth's weather and driving it toward extremes, be they droughts, megafloods or superstorms like Sandy. "Extreme weather of all sorts has been increasing around the Northern Hemisphere. When Sandy hit such a high-impact and vulnerable part of the East Coast, many reporters and local people have asked us whether climate change played a role," said Jennifer Francis of Rutgers University in New Jersey, one of the scientists who looked at the link. "It's the question on everyone's mind." Sandy began its life as a "classic late-season hurricane" over the Caribbean in mid-October, as the National Hurricane Center put it in its summary of the storm. It tore across Haiti, Jamaica, Cuba and the Bahamas, killing at least 67 people and causing enormous damage. While Sandy weakened over the Bahamas, it also ballooned in size, giving its wind field an enormous footprint; then, like many storms that form when and where it did, it curved northward, paralleling the U.S. East Coast, driven by the prevailing currents in the atmosphere. The storm weakened again as it moved farther north over colder waters, but never lost its extreme size. And as it continued on its path, a mass of high-pressure air sitting over Greenland kept it from simply curving out to sea. Not only that, noted Francis and her colleagues in their article, but it also caused the storm to do "something never observed before in records going back to 1851 — it took a sharp turn to the west and toward the most populated area along the eastern seaboard." That's where the Arctic sea ice comes in. The extent of sea ice covering the Arctic waxes and wanes with the seasons, reaching its high point near the end of the Northern Hemisphere winter, and its low point near the end of summer. But as Earth's average temperature has risen with global warming, the Arctic has been warming at two to three times the rate of the rest of the globe, Francis explained. This accelerated Arctic warming has fueled ice melt beyond normal summertime levels, which reinforces the warming because open ocean waters absorb the sun's rays, while ice reflects it. As the Arctic warms, the temperature difference between the poles and lower latitudes is reduced, which influences flow patterns in the atmosphere, because "that temperature difference is what drives the jet stream," Francis said. Atmospheric conditions during Hurricane Sandy’s transit along the eastern seaboard of the United States, including the invasion of cold Arctic air into the middle latitudes of North America and the high-pressure blocking pattern in the northwest Atlantic. The jet stream is what moves weather systems from west to east across the midlatitudes. When the temperature difference decreases, the jet stream slows down, and the kinks, or waves, in it hang around longer, as do the weather systems associated with them. In the case of Superstorm Sandy, a large northward excursion of the jet stream hung around over Greenland, giving Sandy nowhere to go but west. After the convergence of tropical and extra-tropical storm systems, the hybrid Superstorm Sandy made landfall in New Jersey and New York, bringing strong winds, storm surge, and flooding to areas near the coast and blizzard conditions to Appalachia. "Our research suggests that these northward swings in the jet stream are happening more frequently now, especially in the North Atlantic, just like the situation that was in place when Sandy came along," Francis told OurAmazingPlanet in an email. In particular last year, the sea-ice extent (or area covered) in the Arctic reached a record low in September, just over a month before Sandy made its ominous turn toward the coast. Right now, as with other individual weather events and climate change, a direct link can't be made between that record sea-ice low and Sandy's path. "We can't say that the record sea-ice loss last summer definitely created or enhanced the block that affected Sandy, but it's the kind of situation we'd expect to see more of as greenhouse gases continue to build up in the atmosphere and sea ice continues to dwindle," Francis said. Francis added that it is possible to investigate the statistical likelihood that this record low played a part in Sandy's story. "Numerical weather prediction computer models can be used to assess this question," she said. "They can be run with and without the various factors related to climate change to see how the storm would have developed in an environment before climate change really got going." While Francis doesn't have funding ("yet," she said) to study Sandy, she expects many other scientists to delve into the conditions that led to the superstorm. "I'm sure there will be a flurry of studies coming out over the next couple of years," she said. NOAA satellite captures "The Storm of the Century"
What started out as an area of low pressure off the coast of Texas on March 12, 1993 quickly developed into what many people refer to as "The Storm of the Century". The evolution of this winter superstorm can be seen in this imagery from the GOES-7 satellite, using both visible and colorized infrared data. As the storm developed in the Deep South, it spawned 11 tornadoes in Florida and dumped from 8 to 33 inches of snow from Alabama to the Carolinas. As the storm moved north and intensified, conditions became even worse. With a central pressure of 960 millibars, usually found only in Category 2 hurricanes, whiteout conditions were common. Snowfall exceeded 3.5 feet in some locations. When the storm passed, 208 people were dead and $6.6 billion dollars in damage were sustained. The National Climatic Data Center still ranks the 1993 as the most impactful winter storm to hit the Northeast. Though the 1978 and 1996 blizzards may have brought more intense localized conditions, the scale of the 1996 storm has not been equaled in recent history.